The last prophet of the Book of Mormon, Moroni, taught that one of the principal reasons for the ministry of angels is so that those who receive their visitation can then bear testimony of their reality and divine message and, therefore, build faith in others. Moroni declared that God sends angels to “[show] themselves unto them of strong faith and a firm mind in every form of godliness” (Moroni 7:30; cf. Alma 12:20). He further stated that “it is by faith that angels appear and minister unto men” and that “if these things have ceased … it is because of unbelief” (Moroni 7:37). Believers should expect that where strong faith is present, God will send His heavenly ministers to aid His mortal children. Figure 2 Between Heaven and Earth by Annie Henrie Nader. Moroni posited that when the “chosen vessels” of the Lord receive the word of Christ through angelic ministry, they then go forth “that they may bear testimony of him.” “And by so doing, the Lord God prepareth the way that the residue of men may have faith in Christ, that the Holy Ghost may have place in their hearts” (Moroni 7:31–32). Although not everyone receives the visitation of angels, those who have not may gain greater faith and testimony by listening to those whom God has chosen. 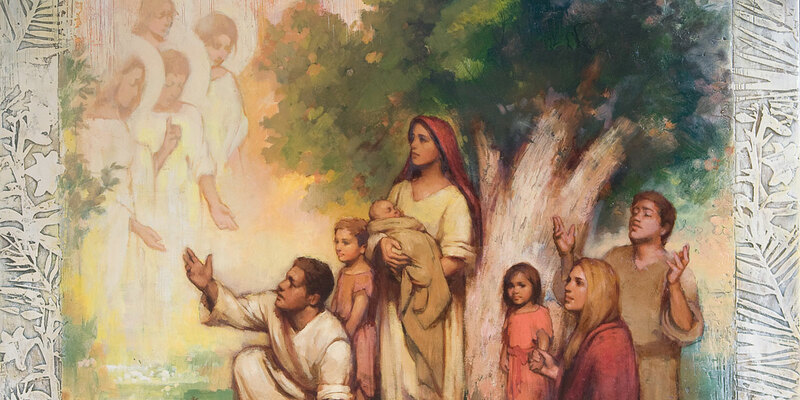 Moroni further taught that angels are sent “to fulfil and to do the work of the covenants of the Father, which he hath made unto the children of men” (Moroni 7:31). God is faithful to the covenants He has made with His children, and the visitation of angels demonstrates that faithfulness, as well as His mercy and love (Alma 24:14). Donald W. Parry, Angels: Agents of Light, Love, and Power (Salt Lake City, UT: Deseret Book, 2013). Jeffrey R. Holland, “The Ministry of Angels,” Ensign (November 2008): 29–31. My non-member daughter-in-law received a visit from my son who died in 2010. She and my other son were struggling with their marriage. She heard him say - not with her ears but directly into her mind - "Be patient with him." She doesn't even believe in God but now she knows there are angels!